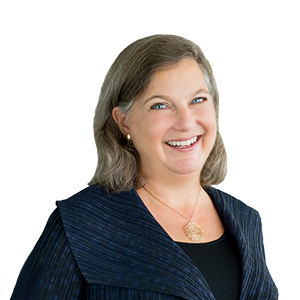 Victoria Nuland is Senior Counselor at Albright Stonebridge Group, where she brings decades of experience in government and international affairs to help ASG clients navigate the global marketplace, with a focus on Europe and Eurasia. Previously, Ambassador Nuland was CEO of The Center for a New American Security. From 2013-2017, she served as U.S. Assistant Secretary of State for European and Eurasian Affairs. As Assistant Secretary, she managed diplomatic relations with 50 countries in Europe and Eurasia, as well as with NATO, the European Union and the Organization for Security and Cooperation in Europe. Previously, Ambassador Nuland served as State Department Spokesperson, as Special Envoy for Conventional Armed Forces in Europe, and as 18th United States Permanent Representative to the North Atlantic Treaty Organization (NATO) from 2005 to 2008. As NATO Ambassador, she focused heavily on strengthening Allied support for the ISAF mission in Afghanistan, on NATO-Russia issues, and on NATO’s global partnerships and expansion. She also served as Principal Deputy National Security Advisor to the Vice President of the United States (2003 - 2005), and the U.S. Deputy Permanent Representative to NATO (2000 - 2003). Earlier in her career, she served as Deputy to the Ambassador-at-Large for the Newly Independent States of the former Soviet Union, with primary responsibility for U.S. policy towards Russia and the Caucasus countries. A career foreign service officer, Ambassador Nuland served as Chief of Staff to the Deputy Secretary of State from 1993-1996, covered Russian internal politics at the U.S. Embassy in Moscow, served on the Soviet Desk in Washington, helped to open the first U.S. Embassy in Ulaanbaatar, Mongolia, worked in the U.S. Department of State’s Bureau of East Asian and Pacific Affairs, and served in Guangzhou, China. Ambassador Nuland earned a B.A. from Brown University.